The Greek diaspora is one of the paradigmatic historical diasporas. Though some trace its origins to ancient Greek colonies, it is really a more modern phenomenon. Diaspora, exile and immigration represent three successive phases in Modern Greek history and they are useful vantage points from which to analyse changes in Greek society, politics and culture over the last three centuries. 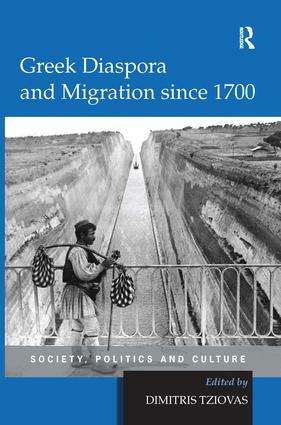 Embracing a wide range of case studies, this volume charts the role of territorial displacements as social and cultural agents from the eighteenth century to the present day and examines their impact on communities, politics, institutional attitudes and culture. By studying migratory trends the aim is to map out the transformation of Greece from a largely homogenous society with a high proportion of emigrants to a more diverse society inundated by immigrants after the end of the Cold War. The originality of this book lies in the bringing together of diaspora, exile and immigration and its focus on developments both inside and outside Greece.